Whitby Town goalkeeper Shane Bland has revenge on his mind ahead of this Saturday’s trip to Nantwich Town after last season’s alarming collapse. The Blues have never won at the Cheshire strugglers’ Weaver Stadium and Bland still remembers a shocking late heartbreak there, last season. “A few of the lads got into a bit of a battle, a bit of a rumble,” the former Middlesbrough gloveman told the Whitby Gazette. 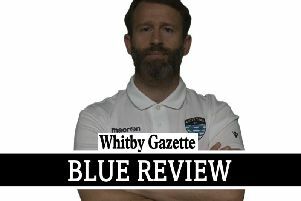 Ben Deegan, who Blues boss Darren Williams accused of a headbutt, earlier in the match, on Town striker Steven Snaith, nodded past Bland in injury time as Whitby let a 3-1 lead slip on to lose 4-3. Lee Mason had slammed the Seasiders ahead on 17 minutes with a spectacular strike before Graeme Armstrong doubled the advantage. Former Telford frontman Steve Foster reduced the arrears, but when Armstrong struck again after the hour, the tie looked dead and buried. However, Max Harrop, who clashed with Ibby Hassan and Richard Pell, made it 3-2, Harry Clayton levelled with nine minutes left and Deegan stunned Whitby right at the end. Williams accused his side of being “lazy” and called their capitulation “shocking”. “I remember being down their place and it was a real tough game,” he said. However, this season has added to Town’s belief they can grab their first win at the Weaver, they lead the sixth-bottom Dabbers by seven points and six places, with two games in hand. Furthermore, in October, the Seasiders enjoyed a 3-1 win at the Turnbull despite a good showing from the away side. Matty Waters, who was unavailable for Saturday’s win over Rushall, netted, with top scorer Dave McTiernan notching two. “I’m very confident that we’ll go down there, get a result and put that 4-3 behind us.” Bland added. Midfielder Lee Mason is ready to feature again after serving a three-match ban for a straight red card at Workington, though defender Lee Bullock remains sidelined with a knee injury. Kick-off at the Weaver Stadium is 3pm. Whitby return to home action a week later when current bottom club Belper Town provide the opposition. A supporters’ bus to Saturday’s game leaves the club house at 9am. The club house plays host to a dominoes drive on Friday (Feb 6) at 8pm and a quiz on Wednesday (Feb 11), 8pm.